A spokesperson to the Edo State Governor, Godwin Obaseki, has released a statement saying the governor was attacked in the state. Robin Crusoe also said the Managing Director of BUA’s Obu Cement Company, Yusuf Binji, has been declared wanted over the attack. BUA and Dangote cement have been at loggerheads over the ownership of a mining site in Okpella, Edo State. The state government asked that work stop on the site and on Wednesday led security officials there were two BUA staff were arrested for allegedly continuing work. Read the full statement below. 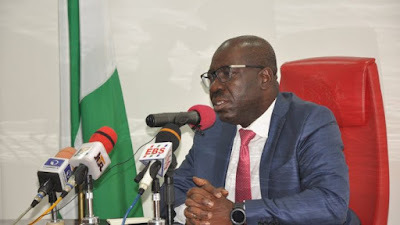 The Nigeria Police have declared the Managing Director of BUA’s Obu Cement Company, Yusuf Binji, wanted over an attack on the convoy of the Edo State Governor, Godwin Obaseki. Also attacked were some officials of the Edo State Government who were on the convoy of the Edo State Governor. According to the police, the decision to declare Mr. Binji wanted became necessary as it had earlier received intelligence that BUA International Limited is sponsoring militias in Okpella, Edo State, where the company has a cement factory and mine sites. These militias, the police said, were allegedly sponsored by Binji and his team to attack the convoy of the governor, cause harm and mayhem.